From the author of What We Talk About When We Talk About Anne Frank. Part absurdist farce, part romance, part political thriller that unfolds in the highly charged territory of the Israeli-Palestinian conflict, focusing on the complex relationship between a secret prisoner and his guard. Dinner at the Center of the Earth is a guilty pleasure — guilty because you wonder throughout if a book highlighting the endless cycles of trespass and vengeance that define the modern state of Israel should be quite so much fun ... Just when you think you’ve been swept into a political thriller with all the headlong energy of the Jason Bourne franchise or a romance viewed through a Vaseline-coated lens, Englander broadens the perspective and you’re back among the real and present depredations of history. Such radical shifts in mood and tone allow him the latitude to do what he’s always done best, in story after indelible story: depict individuals in their quixotic attempts to hang onto conscience, identity and hope while history tries to pry loose their tenuous grasp ... The closest concept the Jews have to limbo is Sheol, a place existing in a purgatorial realm between the poles of paradise and hell — much like, as some might say, the state of Israel itself. Each character in the novel embodies those extremes, oscillating between them, sometimes like a metronome, sometimes like a ticking time bomb ... While parallel lives might have to wait for infinity to converge, opposing narratives may be resolved in stories. And stories about the Promised Land, as this bold, compassionate, genre-hopping novel reminds us, have always traded in impossibility. Nathan Englander is a fabulist: That’s the first thing to keep in mind. Even when he’s trafficking in the naturalistic he aspires to the lesson of the parable ... One of the exhilarating aspects of Dinner at the Center of the Earth is its expansive sense of space and time ... The decision to base a character on such a specific historical personality is a challenging one, particularly for those who remember Sharon as '[a] murderer, … a butcher,' the architect of massacres in Qibya and Beirut. Englander, however, sidesteps history — or blurs its boundaries — by never referring to the character as anything but the General, rendering him instead as an archetype. The same is true of Prisoner Z, who also goes unnamed throughout the novel, as well as a double agent known mostly as the Waitress, although she is more fully identified toward the end of the book. The effect is to heighten events, to transcend history in favor of a more allegorical realm ... If this feels a little forced in places, well, that too is in the nature of the fable, which is a story in the service of a moral, after all. This has been Englander’s intent from the beginning, and with this novel he articulates and expands on such a sensibility, framing history as both an act and a failure of the imagination, which is to say, in inherently, and inescapably, human terms. ...a moving, if sentimental, story of espionage, disappointed idealism and love across borders ... A twisty tale of spycraft and false allegiances unfolds, but what stands out is Mr. Englander’s insistence on finding romance amid the violence and deception. Spies fall in love with counterspies, Israelis with Palestinians, Prisoner Z with his guard. During the aborted peace process, the General strikes up a warm rapport with Yasser Arafat. The ageless struggle between Jews and Arabs comes to resemble a desperate lover’s embrace. But some of Mr. Englander’s most fervent devotionals are to the land itself, with its flowering deserts, 'the waterfalls and Nubian sandstone, the great dusty mountains and their spectacular views.' That ingrained attachment—and the conflicts it causes—continues to pull Jewish writers from the known world of America to this maddeningly unsolvable puzzle of a nation. 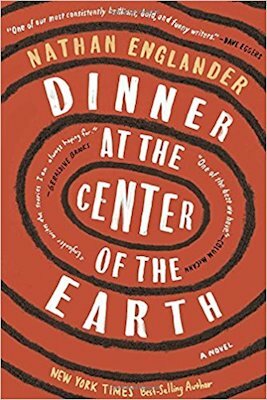 What did you think of Dinner at the Center of the Earth?